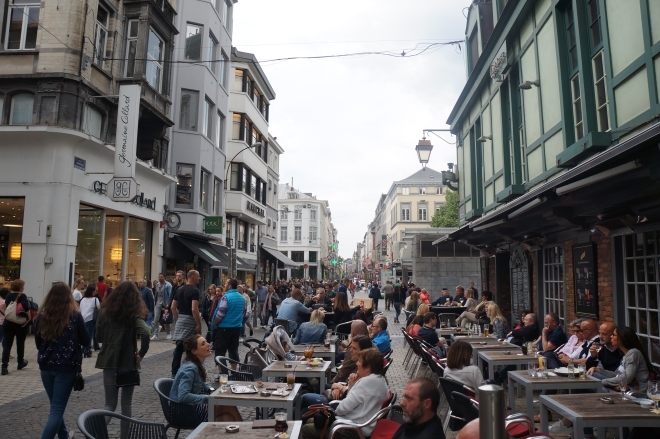 On a recent visit to Belgium, we had the opportunity stop in Liège and get a taste of the city’s joie de vivre. 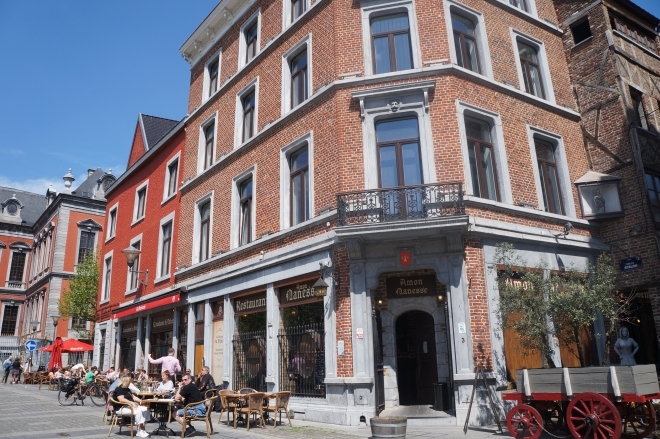 Liège with its countless hidden treasures is the most visited city in Wallonia, the French-speaking region of southern Belgium. As of January 2013, Liège has a population of 197,013. We think the city’s small population is the reason why the locals are so friendly and approachable. The food and sights are deeply historic and truly unforgettable. We had an amazing time and wanted to share a few highlights of the trip. Here’s just a small sample of all the wonderful things to do and see should you ever be in that neck of the woods. 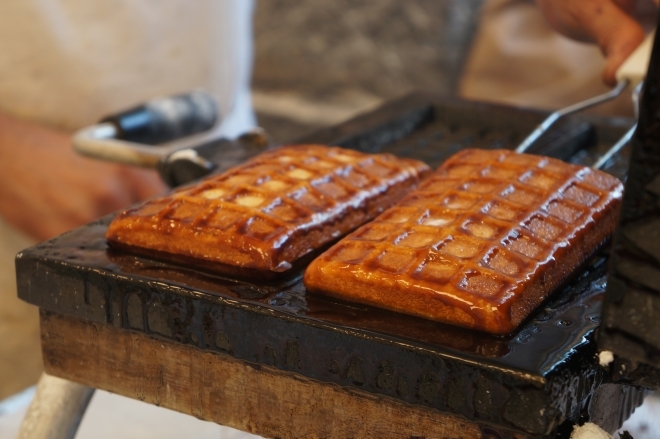 The search for great authentic Liège waffles was tops on our list. We found just that at Pollux, a popular waffle bake shop right in the town center. Pollux is centrally located on the Place de la Cathédrale, making it the perfect place to enjoy views of St. Paul’s Cathedral (though under restoration on our visit) and people watch on the busy main street, restricted to pedestrians. It’s best to stop by the store early (they open at 9am) as it gets crowded quickly. 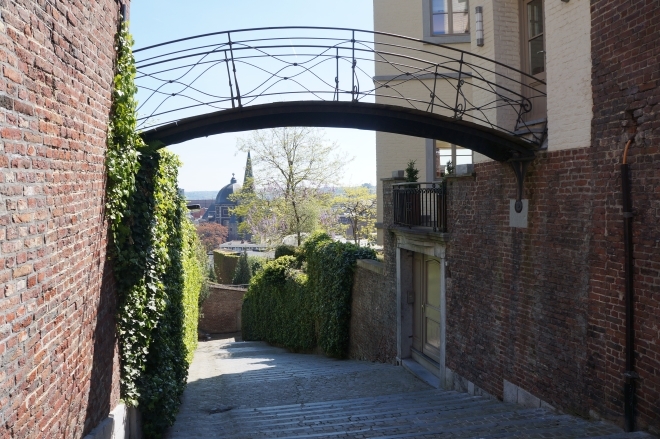 Another highlight was the famous stairs leading up to Thier de la Fontaine into the residential neighborhoods of Saint-Laurent. 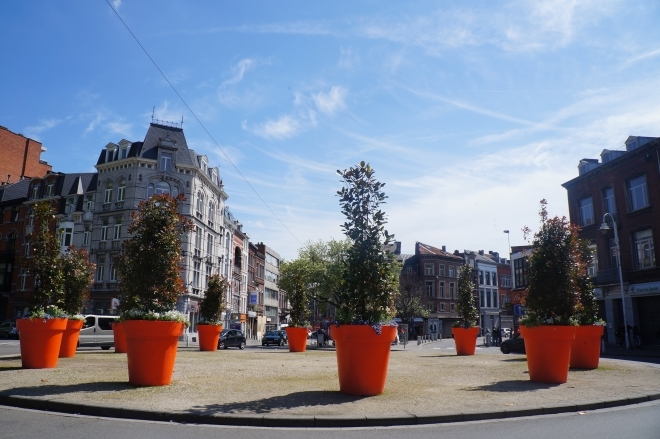 Saint-Laurent is an administrative district of the city of Liège located on the Publémont, one of the hills west of the city center. Many homes in Rue Saint-Severin and Rue Hocheporte date from the 17th and 18th centuries. It was worth escaping the city for a few hours and exploring the renowned area. The Cathedral in the horizon is Collegiate Church of Saint-Jean, founded by Notger in 981, the collegiate church of Saint-Jean is similar to the Chapelle Palatine, built by Charles the Great in Aix-la-Chapelle. 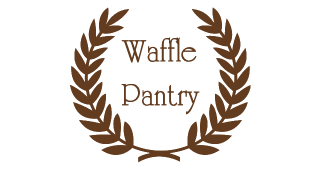 We couldn’t spend too much time away from food and were able to get an exclusive look inside a commercial bakery that specializes in fresh made stuffed waffles for smaller nearby bakeries. We saw them make tons of delicious treats like waffles filled with a variety of fruits including apricot, apple, strawberry and more. There were young men running in and out of the bakery carrying waffles to other bake shops nearby for all the hungry customers. It was quite a sight! Check out our Croquade Salty Filled Waffle Plate if you crave to recreate this delicious experience at home. Liège is an area of French and German influence. Though the residents are predominantly French-speaking; there are also German and Dutch-speaking minorities. Locals are proud of the French language and appreciate it when visitors attempt to speak French before trying in English. A tip to keep in mind, a little French goes a long way here. Don’t be shy to use a few phrases. It was fun to delight the locals with our attempts. 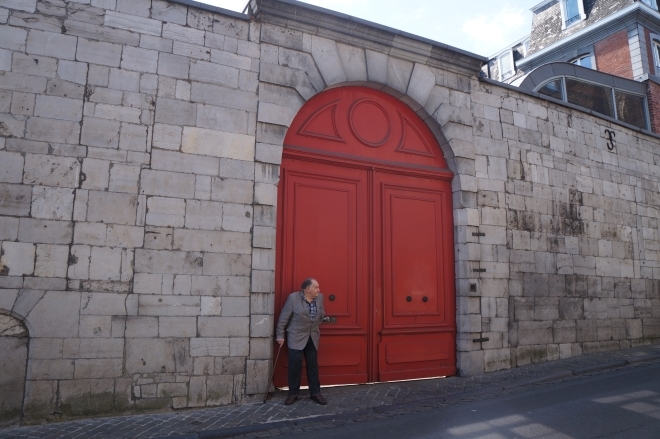 Here we couldn’t resist taking a picture of this stately door on Rue Du Mont Saint-Martin near the Mont St. Martin (pictured in the next photo). 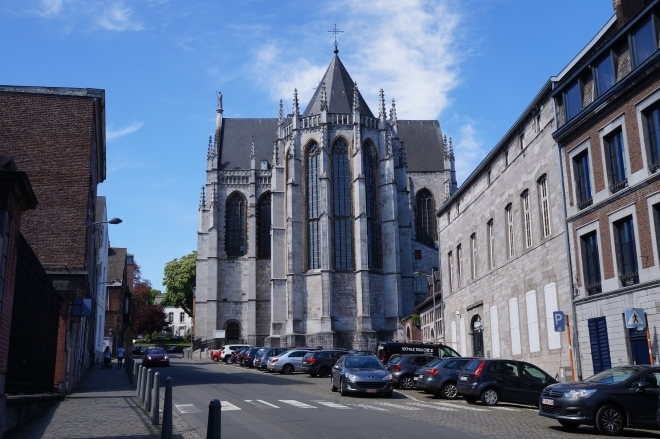 The Basilica of Saint Martin is a catholic church and one of the seven former Collegiate of Liège (privileged witnesses of the birth of the principality of Liège). A 10th-century Romanesque building, known at the time as the Collegiate Church of St. Martin, it was replaced by a new Gothic church in the 16th century. Our tip, climb the narrow staircase up the tower of the church for an unbelievable and complete panoramic view of the city. We found our own version of heaven inside pastry shop, Une Gaufrette Saperlipopette. 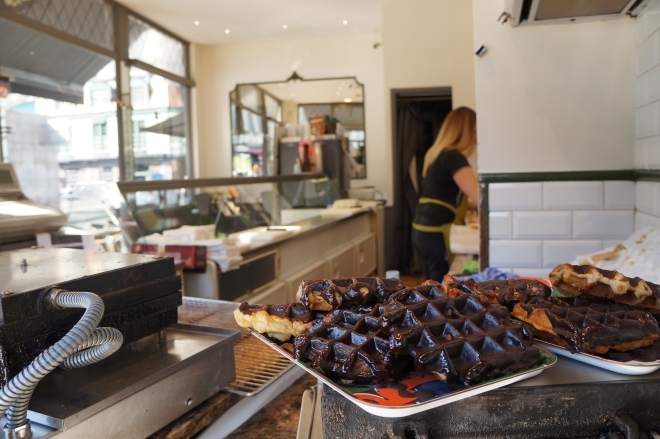 The bakery is the perfect place to try a wide variety of traditional Belgian pastries. Everything’s made from scratch daily and has a homemade quality that’s a pleasure to savor. Their menu and offerings changes with the seasons so you never know what’ll be available if you visit at various times of the year. 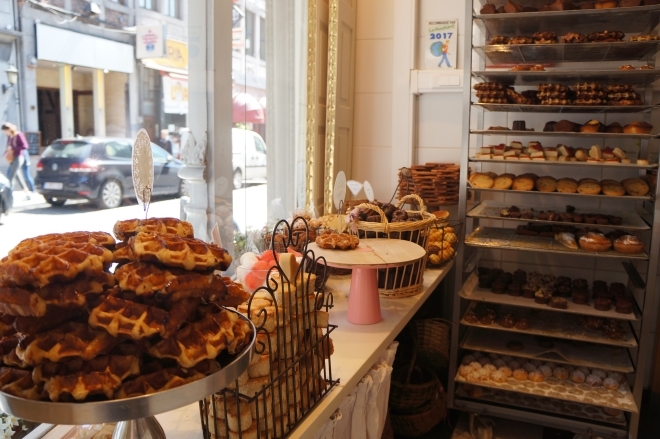 It’s also a paradise if you’re in search of freshly made Liège waffles. Definitely a must on our list of places to stop by. For those who aren’t fluent in French, a phrase you should learn before you go to Belgium is “deux bières s’il vous plait” (two beers please). Belgium is famous for its amazing beers. Belgian brews are high on our list of Belgian treats. Stop by one of the many ‘brasseries’, a French-style casual restaurant, similar to a bar or pub. 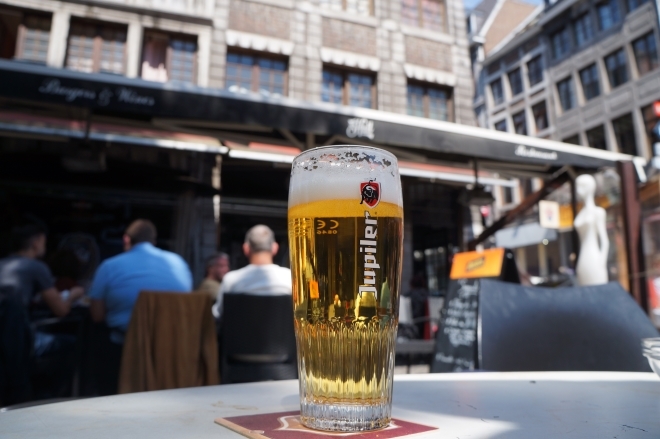 While there are many local brews to choose from when traveling in Belgium, the regional beer that everyone drinks in Liege is called Jupiler, a crisp and refreshing beer. When you request “deux bières s’il vous plait“, Jupiler is served by default. It often comes in a 0.25 cl serving which is about half a pint. We consider it the perfect pick-me-up refreshment before continuing to stroll the streets. 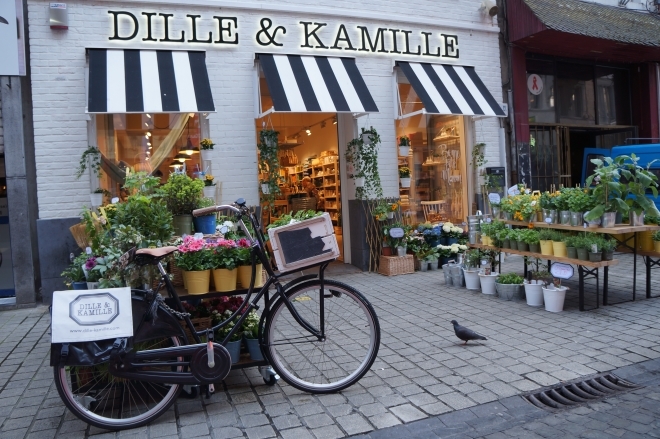 Another highlight is Dille & Kamille on Rue Pont d’Avroy, a shop offering a variety of natural products including flowers, pots, gardening tools, candles, pots and soap. Did you know Belgium is the 5th largest exporter of cut flowers in the world? It’s a region of the world everyone should pay a special visit to during spring and summer. It’s truly a place in bloom! Have you ever visited Belgium? What were your favorite sights and things to do?